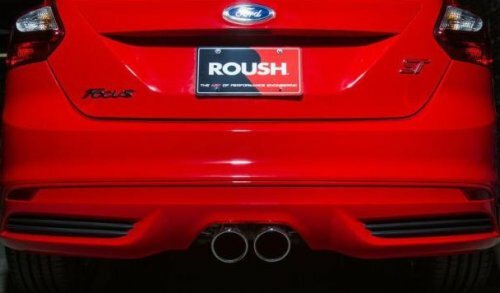 Roush Performance has made a name for itself by offering high performance add-ons and complete high performance packages for the Ford Mustang and F150 but with Roush’s new offerings for the Focus ST – the Roush name is climbing back into the sport compact world. Roush last dabbled in the sport compact segment back in 2005 when they offered a post title package for the standard Ford Focus with a special emphasis on exterior design and handling. However, with the high performance characteristics of the new Focus ST – Roush is taking a different approach to improving on the modern Focus. Right now, Roush is only offering two simple components for the Ford Focus ST including a cold air intake and a performance cat back exhaust system but the company expects to soon expand their Focus ST catalog with items like engine calibration upgrades (performance tunes), suspension components, wheel/tire packages and exterior accessories that could come in the form of an aggressive body kit similar to what was featured on the Roush Focus back in 2005. Roush has not stated what kind of power increases Focus ST owners can expect from the cold air intake and the performance exhaust system but the video at the bottom of this article offers a chance to hear the Roush exhaust in action when connected to the 2.0L EcoBoost engine of the ST…and it sounds pretty awesome. Roush also states that the cold air intake package will enhance the sound of the stock ST blow off valve for those who want to make darn sure that everyone around them knows that they have a turbocharger. "We are very excited about expanding into this market segment." States Tim Wheeler, VP of Sales and Marketing at ROUSH Performance. "We are dedicated to developing quality parts to support a variety of the performance minded automotive lifestyles and with the rapidly growing sport compact segment, the Ford Focus is a natural fit for ROUSH Performance." In addition to offering the cold air intake and performance exhaust system for the Ford Focus ST with more items on the horizon, Roush also plans to offer stuff for those who buy the standard, non-ST Focus. Even though the Focus ST is clearly the best choice for someone who wants to go fast, the standard Ford Focus is a fun little car to drive and with more people buying a standard Focus over the Focus ST, the non-ST market will be substantially larger than the ST market – even though ST buyers are far more likely to look to improve the performance of their hot Ford hatch. Right now, Roush is only offering a cold air intake package for the non-ST 2012-2013 Ford Focus but consumer demand coupled with early popularity of ST components could encourage the company to expand their catalog for the standard 160 horsepower Focus in S, SE or Titanium trim. Unfortunately, Roush Performance is not yet listing prices for the Ford Focus ST cold air intake or exhaust system on their website but a search of the internet found the ST cold air intake package for $279.99 while the Roush ST exhaust appears online for $599.99 (both prices from HorsepowerDirect.com). Roush is currently accepting pre-orders for these Focus ST components with an intended delivery date of July 2013. We have included two videos below – one showing the Ford Focus ST equipped with the Roush performance exhaust system revving the engine and another showing the car revving the engine before making a dyno run. Sadly, we don’t get to see what kind of power the Focus ST makes on that dyno but this second video gives us a great opportunity to hear the Roush exhaust and wide open throttle. With any luck, Roush will offer up performance numbers for these items once we are closer to delivery.